LADEE moon mission: NASA Ames director on the future of space exploration. NASA has big plans for robots and tricorders. 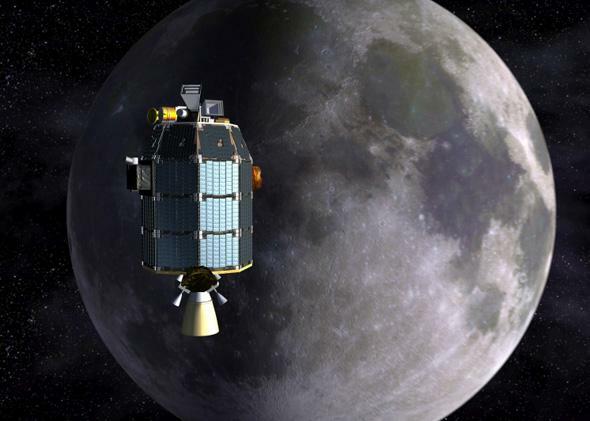 An artist’s depiction of NASA’s Lunar Atmosphere and Dust Environment Explorer (LADEE) observatory as it approaches lunar orbit. A new moon orbiter launched Friday night. Pete Worden, director of NASA Ames Research Center in Moffett Field, Calif., which designed the LADEE orbiter, says forget the 20th—this is the real space century. Stephen McLaren: What will NASA’s new lunar orbiter do? Pete Worden: The Lunar Atmosphere and Dust Environment Explorer (LADEE) is a $250-million mission to probe the moon’s exosphere and learn how it would be affected by increased human activity. It is also a low-cost modular probe, which will serve as a test bed for future cheap space missions. SM: What other cool missions are you working on? SM: What kind of work is done at NASA Ames? PW: We are primarily about research so, in addition to missions, we develop technology. We are building autonomous software into robots destined for the moon, for example. We also have a tradition of spawning new industries. For instance, when a Mars mission planned in the 1990s turned out to be too expensive, one of the lead scientists redeveloped the fuel cells for use on the ground. This led to the founding of Bloom Energy, which now develops these modular power systems. SM: Do you often collaborate with Silicon Valley? PW: Yes. We’ve set up a lab called Space Shop so that if someone has a clever idea, they can very quickly build a prototype. The company Made in Space used the lab to build a 3-D printer that will be used on board the International Space Station to print out parts for machines. Eventually we think we’ll be able to print out satellites. The Optical Ground Station in the Canary Islands will relay data to LADEE at unprecedented rates using infrared light beams. SM: How will this extend our reach into space? PW: Well, genome printing is on the horizon too. So if you have a settlement on Mars and need pharmaceuticals you can just have the code sent from Earth. The same goes for printing biological hardware, like human organs. There are lots of start-ups doing very cool stuff like that. If you’ve seen handheld “tricorder” scanners on Star Trek, one group is even developing those kinds of things. Everyone who’s read science fiction knows we will need that type of technology when we set up colonies on Mars. 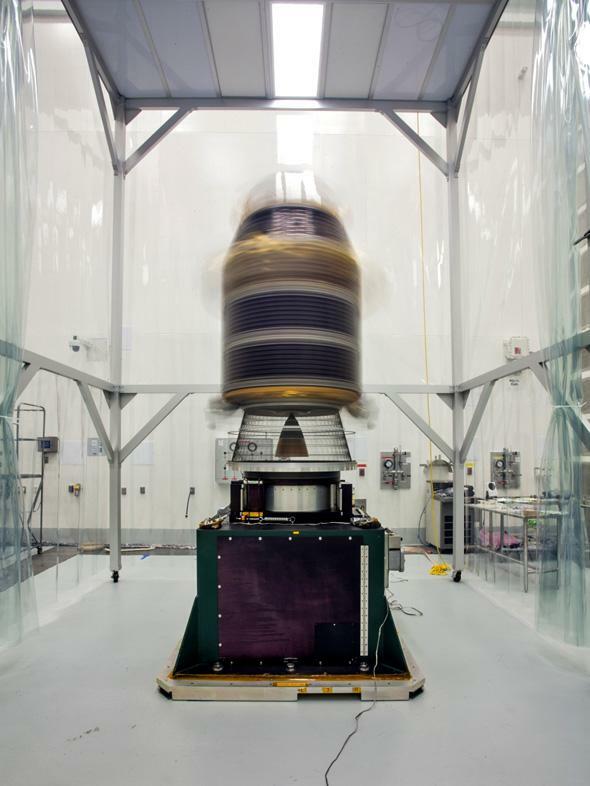 During preparations for NASA’s Lunar Atmosphere and Dust Environment Explorer (LADEE) observatory launch on Sept. 6, 2013, engineers mounted the spacecraft onto a spin table and rotate it at high speeds, approximately one revolution per second, to make sure that the spacecraft is perfectly balanced for flight. SM: Is science fiction a big source of inspiration? PW: Here, there’s almost a secret handshake among engineers who have read lots of science fiction. It lets you dream—how can we make that technology real, how can we make a better future? SM: What are your dreams for exploring space? PW: A principal tenet of science fiction is that there are planets out there with intelligent life. For most of the history of astrophysics we haven’t been able to see those worlds, but we are starting to see planets like Earth. I dream of going to those worlds. That’s my life’s inspiration. SM: What excites you most about your work? PW: This century, even more than the last one, is the space century—especially with the private sector and many more countries getting involved. The stuff we’re doing at Ames is turning science fiction into fact. This is the coolest job I have ever had.